I have my son's boy scout shirt and patches and would love to make something for him from them. Any suggestions on this would be so appreciated. I already have t-shirts for a quilt so maybe some type of small lapsize quilt or throw. Has anyone done this? If so, please post some pics! thanks! 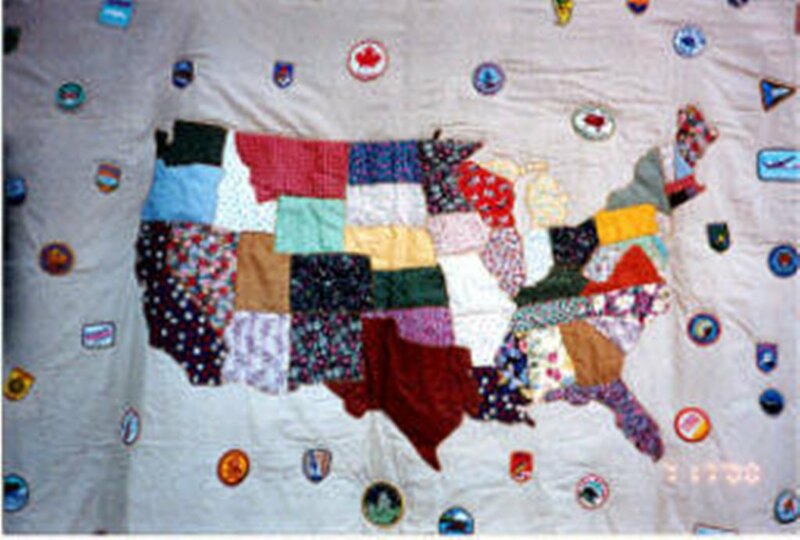 Is your heart set on a quilt? My mother-in-law made a wonderful shadow box with my husband's boy scout uniform and patches, along with several of his soccer shirts, soccer patches, pictures of him playing soccer and football, and even the tiny cast from his 4-year-old broken arm. (My DH is 6'4", I can't believe it ever fit on him!) I liked it so much, and she did such a great job on his, so I asked her to make one for me, and she did! Mine has all my girl scout patches, patches that I had collected from every state I've traveled to, all of my chenille letters from high school and jr high, a picture of me as a baby, awards I won in school, and an apron I cross-stitched and sewed in Home Ec. Everyone that visits us loves to look at the shadow boxes and there are quite a few stories told about the objects in them. I love the fact that these items are displayed and not stored in a box somewhere. I had a "camping" jacket when I was a kid that was covered with patches from all the places we visited when I was a kid. I made my folks a full sized quilt to use on the bed of their RV. Found a map, blew it up and used it as the out line for my appliqued map and then sewed the patches around it. How great is that??? love it. Loving the idea too! although he doesn't have rv. just would be a sofa throw I guess or over chair in bedroom or something like that. I'm not set on a quilt or shadowbox. They seem extremely hard to put together using bulky items. I guess it could be done but I've never tried anything like that. Better with sewing machine, needle and thread! Keep those ideas coming. Thanks for these two! They sound beautiful! I'll bet you love them. I have no idea how to put one of these together. Would probably take me forever. I really need to get this done before he gets too old to appreciate it! lol! thanks for sharing this idea though. What if you did a throw with a "sash" at an angle (as if it were being worn) with the badges attached in the proper positions. Last edited by COYOTEMAGIC; 02-26-2012 at 08:56 PM. I can't find a free pattern but this is what I was thinking. Good Luck!!! Love this idea! will have to think on ti. I will put a picture if I ever get it made! thank you! I looked at the site but not quite sure what you had in mind with the patches and shirt. Did you mean to cut the shirt and make smaller shirts? yes, i love the Boy Scout fabrics. will definitely use them in it somehow. Thanks!